We hope third time is the charm for this taco vendor but we have our doubts. This orange taco trailer has seen better days. In late 2009, it appeared as El Tizoncito. In the early 2010 taco season it became Taco Loco. 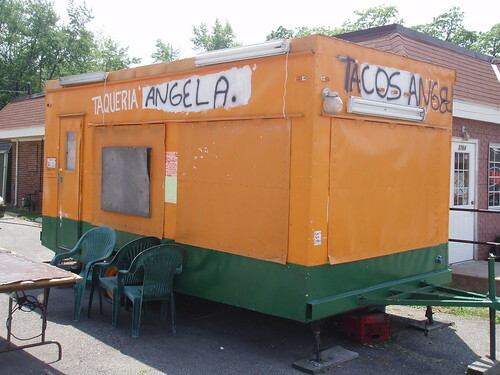 Now it is Taqueria Angela. It is showing some significant wear and tear. Scouting missions have come up empty handed many times, we could see no signs of life. The owners of the restaurant next door report the truck is open…”sometimes at night, sometimes not”. We would probably not even mention this truck but since it is at a known location and because readers have asked about it, we have to give you something to work with. 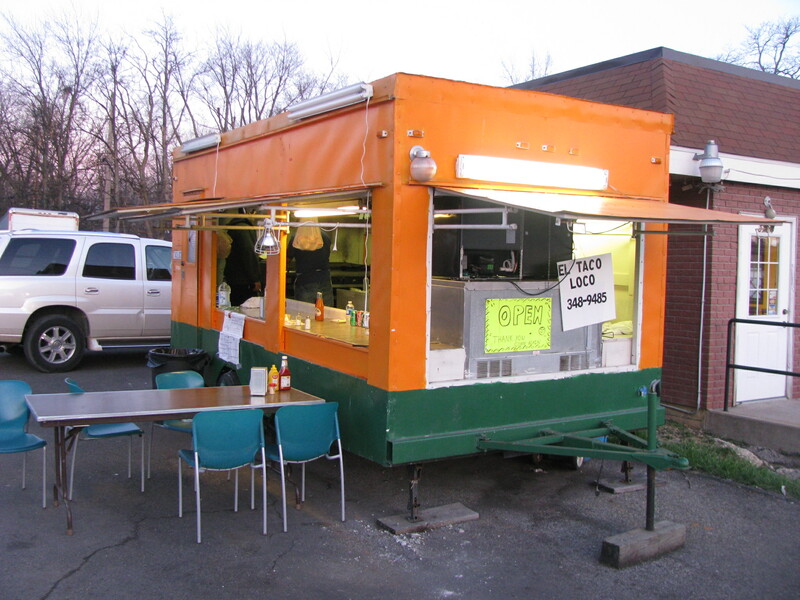 We have never steered readers from any taco truck…but this may be the exception, (if it is open). I did catch the current owner at the truck in early August. Things did not look so promising. The owner asked if we would wait a month or so until he could pick a new name, paint a new sign and update a few other things. He was going to call when he was ready. We never heard back and drive by scouts in early September showed no activity. Stay tuned. If you are in this area, consider hitting the Cleveland Ave. trucks or Los Texanos on Weber Road. On the bright side, the parking lot behind this location used to be a graveyard of unused taco trailers. The trailers have disappeared as of July 2010 so maybe they are being reborn to push the number of taco trucks over the 50 mark in 2010. That would be muy, muy bueno. The photo below is from better days. Hi! Two weeks ago we were driving up Cleveland Ave. on a Sunday looking for a taco truck and came upon this truck. They had pork roasting on a spit and we ordered lunch. I had two corn tacos with the pork and they were really delicious. My husband had a taco and a quesadilla also with the pork and his was very good as well. The sauces available were outstanding. So I guess it’s too bad that they are unreliable because they make very good food. This is worth talking about because it seems to be the farthest south location on Cleveland Ave. for taco trucks and therefore the most convenient for many of us. I also have found it unstaffed before but one night I found it going and busy and I enjoyed my tacos and the toppings.